Written, arranged and produced by BB3 Dynamics (www.BB3Dynamics.com) in Berlin, New York and London. Lyrics by BB3 Dynamics. The voice of "Your Conscience" provided by British actor and voice over artist Adam Kee. Mixed by Brooklyn mix and audio engineer Evan Sutton. Remixes provided by Abe Duque, Astrolith and Metel EkToshi. Artwork concepted and designed by New York visual artist Angela Liuzzi. 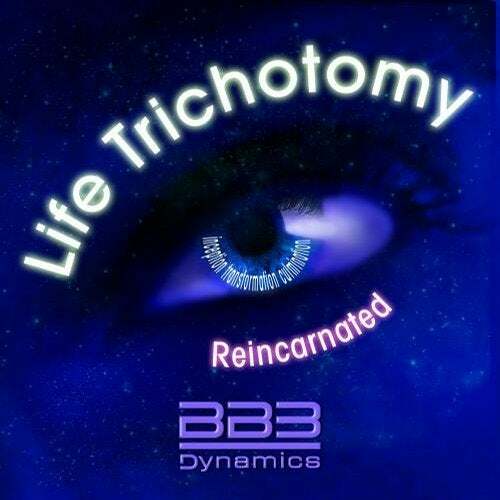 ||| BB3 Dynamics releases the companion Techno remix EP to his recently released "Life Trichotomy EP" on 13 November 2015 entitled "Life Trichotomy Reincarnated EP" with dance floor banger Techno remixes. ||| Continuing with the previous theme delivered in the "Life Trichotomy EP", BB3 Dynamics has brought philosophical thinking to the dance floor with his approach to a philosophical Trichotomy on life. The "Life Trichotomy Reincarnated EP" contains songs from the "Life Trichotomy EP" that have been remixed by other artists including American Techno pioneer Abe Duque, American Techno and Hip-Hop boundary pusher Astrolith and French Techno experimentalist Metel EkToshi. Like many major philosophers such as Plato, Plotinus, Aquinas, Kant, Socrates, Hegel and Freud who have put forth philosophical principles in groups of three, BB3 has put forth his life Trichotomy principles through his take on Techno music. The first song in the Trichotomy, entitled Inception, communicates the importance of not holding back at the beginning of life. The second song in the Trichotomy, entitled Transformation, communicates the importance of being in control as one moves through life. And the third and final song in the Trichotomy, entitled Culmination, communicates the importance of letting oneself be free as one prepares for one's next lifetime at the end of a current life. Says BB3, "With the "Life Trichotomy Reincarnated EP", I wanted other artists to deliver what their perception would be if they reimagined the songs from their own realizations, worlds and life experiences. And each artist came back with incredible Techno dance floor explosions!" The EP also contains instrumental versions of the original songs. ||| About BB3 Dynamics | Bates Belk III, i.e., BB3, is a global producer and sound designer, currently based out of Berlin, Germany, whose high energy songs and remixes have moved international audiences on dance floors in Paris, London, Amsterdam, Berlin, Tokyo, Rio de Janeiro and states side audiences in New York, Los Angeles, San Francisco, Chicago and Miami. He is also the founder of BB3 Dynamics Music Productions (www.BB3Dynamics.com). BB3 Dynamics previous music releases include OUTTASIGHT, It's in the Mind, Bionic Power (Pushing Harder, Jumping Higher), Cosmic Kenny, Danger with a Stranger, Get Me to the Disco and the Life Trichotomy EP. BB3 is currently working on his first album.